Jarrett Jack smiled over at his former Pacer teammates when he came in off the bench, foreshadowing what became his best effort of the season. Jack was 7 for 7 from the field, scoring 18 points and handing out 6 assists as the Raptors defeated Indiana 123 – 112. Jose Calderon also had a big game, scoring 21 points and dishing out 7 assists. The two guards played on the same line for key portions of the game, a combination that impressed Raptors Head Coach Jay Triano. Last season, the Toronto Raptors had a choice between Calderon and T.J. Ford at the point. Ford was a selfish player, unable to come off the bench without feeling slighted while putting up lesser numbers than his teammate. Ford had 16 points last night but was ineffective against both Calderon and Jack when it counted, putting more pressure on Danny Granger to step up. Granger did his part, scoring a game high 36 points while fetching 9 boards, but it just wasn’t enough. Raptors rookie DeMar DeRozan continued to see his playing time diminish, scoring 8 points in just 10 minutes as a starter. Rasho Nesterovich finally got some quality playing time and used it productively, scoring 12 points to go along with 7 rebounds in 16 minutes. Chris Bosh struggled with his game but still had his twelfth double double of the year, scoring 16 points and grabbing 12 boards in the victory for the Raps. Toronto continues its heavy schedule today as they face off against the Charlotte Bobcats. It was one of those games that could have gone either way…if the Magic were playing Cleveland or Boston. But against the Raptors on Sunday afternoon, Orlando kept up the pressure and proved the Raps are once again a predictable squad as the game winds down. Orlando came back from a weak first quarter and traded momentum with Toronto until both teams let their second line players ultimately decide their fates. Jason Williams, starting for the injured Jameer Nelson, and J.J. Redick hit decisive threes in the fourth quarter to put Orlando up by 10 and an eventual victory, 104 – 96. Vince Carter, who was customarily booed all afternoon, finished with 24 points, twelve of them in the third quarter. The former Raptor started the game poorly but kicked it up a notch in the second half…literally. Andrea Bargnani struggled for the Raps, scoring just 11 points to go along with 9 boards and fouling out with 4 minutes left in the game. Chris Bosh scored 22 points but was contained well by the Magic who made him settle for jumpers most of the game. Hedo Turkoglu was a non factor, scoring twelve points on 3 of 11 shooting from the field, while Calderon scored 16 points but managed just 4 assists. The bigger story may have been the disappearing act of DeMar DeRozan. The rookie failed to step up against Carter and was not a factor at all throughout the game. Once again, speculation on whether or not DeRozan will still have the starting job when either Wright or Evans returns is swirling around the ACC. Head Coach Jay Triano appears to be trying to instill confidence in the young guard, but what is it costing the Raptors in the interim? DeRozan scored 1 point and 1 rebound in just over 17 minutes of playing time. 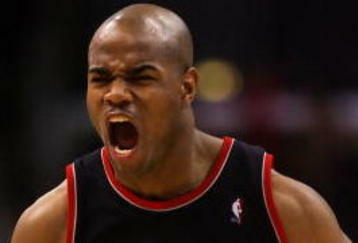 Meanwhile, Jarret Jack continued his strong play of late, handing out 9 assists to go along with 8 points and 7 rebounds. The Raptors fall to 6 – 8 on the season and will face the Indiana Pacers on Tuesday at the ACC. They needed it. They needed it badly. The Toronto Raptors are an interesting team this year. Once again they find themselves unable to cope with opposing big men and perimeter defense, but this time something is different. The Raptors returned home and easily handled the Miami Heat 120 – 113 in a game that saw some much needed clutch shooting by Jarret Jack in the final frame. Jack scored 12 of his 17 points in the fourth, securing victory from a pesky Heat squad that rattled off a 14-0 run that cut Toronto’s lead to just 2 points. Chris Bosh continued his contract-year style of play, pouring in 29 points and snatching 12 boards. Bosh also had four blocks in the victory. The team looked rejuvenated after looking worn out in Utah on Wednesday where they collapsed in the final half. The team outrebounded their opponents for just the second time this season. Andrea Bargnani finished with 24 points to go along with 10 boards and was key down the stretch, hitting a clutch three pointer and driving the lane with some big man authority. DeMar DeRozan, still trying to feel comfortable as an NBA starter, made up for his disappearing offense by pulling down 7 rebounds of his own. DeRozan is expected to continue starting for the Raps but may be relegated to bench status once Antoine Wright returns from a sprained ankle injury. Dwayne Wade and Mario Chalmers each scored 30 points for the Heat who fall to a record of 7 – 6 on the year. The raptors are now 4 – 1 against Eastern Conference teams, second only to the surprising Atlanta Hawks who have an 11 – 2 record on the season overall, including a 6 – 1 record against the East. 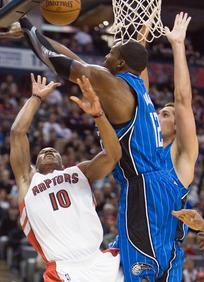 The Raptors play the Orlando Magic on Sunday afternoon at the ACC. It had the air of a preseason game by the start of the fourth quarter. 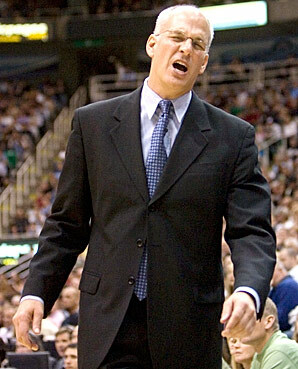 Raptors head coach Jay Triano had 5 non starters on the court in an eight point deficit to the Denver Nuggets, losing 130 – 112 in an embarrassing display of poor defense and severe bench mismanagement. Carmelo Anthony, Kenyon Martin and Nene Halario accumulated 67 of the Nuggets 130 points, completely dominating the Raptors starters at both ends of the floor. J.R Smith also had an impressive 29 points off the bench in just 21 minutes of playing time. The loss was another defensive collapse by the Raptors who have now allowed 109 points per game, 2nd worst in the league. It also showed Triano’s potential weakness as a coach as key players like Rasho Nesterovich played just 8 minutes while Nugget big men were scoring easily in the paint. Demar Derozan had a good night on paper, but his 17 total points came when the score didn’t matter and Anthony schooled the rookie for most of the night. Anthony was suffering from a migraine headache and still managed to dominate Toronto at both ends. The Nuggets also managed to cool down Bosh’s game, holding the Raptors forward to just 13 points. Bosh still managed to put up a double-double by grabbing 14 rebounds, his eighth of the season – but his inside game disappeared and Triano’s team settled for jumpers while allowing the Nuggets to score almost at will. 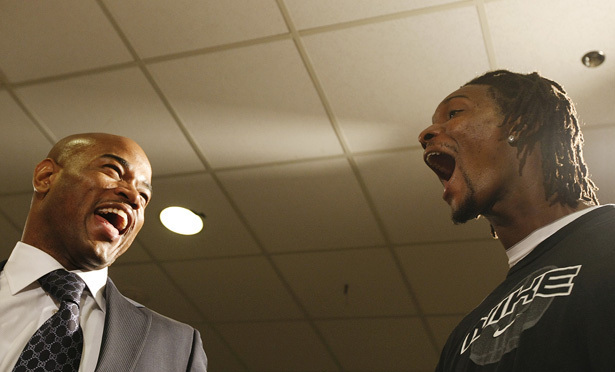 “They were physical on Chris Bosh, they were bumping him all night and he only got two free throws,” Triano said. Denver head coach George Karl had the same thought. The Raptors are now 5 – 6 and play the Jazz in Utah tonight. North America is a polarized continent. Liberal, Conservative. Bleeding hearts versus the heartless. Left versus right. It is this kind of fodder that makes American cable news programs salivate. But this is Canada, where political stripes are drawn here and there by a complacent citizenry who may not even know what wing they tend to flap. And Canadians may be all the better for it. Dalton McGuinty’s Provincial government’s harmonized sales tax is a perfect working example of how certain issues fall on both sides of the political sphere. Most Ontarians are against the plan – a tax that would see the 8% Provincial and 5% Federal GST merge for hundreds products and services. In any event, both Liberal and Conservative critics at the federal and provincial levels have criticized the bill, calling it a tactic of deception for a government who is trying to supplement their own inadequacies by pillaging ordinary citizens out of their hard earned cash. So back to Left versus Right. Thankfully Canada does not have a Sarah Palin to really test my theory that most Canadians could care less what side we tend to gravitate towards. We do have perennial hacks like Alice Klein and Rachel Marsden – but they tend to preach to sparse, stupidity-addicted choirs who fall in line whenever ideological conjecture overrides stone cold facts. Other, more thoughtful individuals look at issues one at a time. You might be a weed smoking gun owner; an anti-war protester who believes Israel has a right to defend itself, or perhaps just a lazy musician who doesn’t want to get taxed if his burrito costs more than four bucks. Believe it or not, Canadians tend to hold beliefs that dance inside the vast political spectrum, only they have no idea what you mean when you tell them so. Good for us. Who needs the labeling of left or right to prevent us from speaking honestly on which issues we are concerned about? 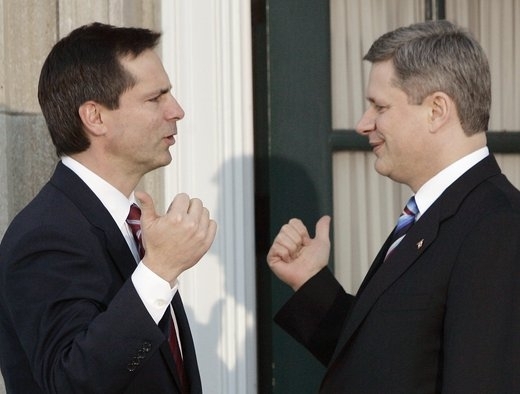 Even McGuinty received help from Prime Minister Stephen Harper – two good old boys on the opposite sides of ideology – to pass this bill. If those two can put aside political differences and proceed to gouge consumers then I don’t see why ordinary Canucks can’t rally together and vote against their overall ideology in the next Federal and Provincial elections. Ah yes, a harmonized electorate doing what’s best for Canadians. The most competitive game against a top tier team this season turned sour for the Toronto Raptors as Hedo Turkoglu missed a shot at the buzzer, handing the Raps a heart breaking loss to the Suns, 101-100. The miss, combined with Phoenix’s stellar shooting from the free throw line, solidified victory for the first place Suns. Amare Stoudemire celebrated his 27th birthday scoring 30 points, including a 10-11 night from the stripe. Steve Nash dominated fellow guard Jose Calderon, throwing down 23 points and adding 9 assists. Calderon finished the contest with just 8 points, going 3 for 7 from the field. Stoudemire and Nash bounced back after mutual poor performances against the Lakers. The Suns’ tandem left the Raptors wishing for the kind of clutch experience the Phoenix club is known for , with Nash driving the lane, drawing the foul and scoring with 38.9 seconds left, extending the Suns home court win streak at 4 games. Channing Frye’s 6 three pointers once again exposed Toronto’s weak perimeter defense, while Stoudemire’s inside play gave Phoenix a one-two punch all night long. Chris Bosh had his 8th double double for the Raptors, scoring 25 points and pulling down 10 boards. Turkoglu finished with 20 points and Andrea Bargnani chipped in with 17. The Raptors can take a few small victories in the loss as the team finally showed it can compete against a formidable opponent like the Suns. The team shot well in the first 3 quarters but ended the game shooting just 39% in the final 12 minutes. Despite the low percentage, Toronto managed to hold the Suns when it mattered, forcing Phoenix to make clutch shots of their own. Phoenix is currently undefeated at home this season, their 4 and 0 record matched by just the Western Conference’s Milwakee Bucks and Atlanta Hawks. The club is 9-2, good for first place in the Western Conference, and have scored over 100 points in every game so far this year. Toronto falls to 5-5 and is a half game behind the 8th seeded Chicago Bulls. The team travels to Denver for a game versus the Nuggets on Wednesday. Call it the peek after the valley. The Raptors showed the upside to inconsistency yesterday as they turned a 22 point deficit into a 15 point victory in Los Angeles, defeating the Clippers 104-89. As was the case in a victory against the Bulls earlier in the week, the Raps had to overcome an abysmal first half and rally to secure the win. Head coach Jay Triano, while pleased with the end result, still has no answers as to why the club shows a schizophrenic style of play thus far this season. “We said we wanted to come out with three straight stops (in the first quarter) and we did and then they scored 15 straight (possessions) almost in the first quarter. “I have no idea, I have no answers. Our coverages are where they’re supposed to be. Amir Johnson was key in the comeback, pulling down 9 boards in 19 minutes of playing time while sharp shooter Marco Belinelli continued his stellar shooting with 15 points off the bench. Belinelli, along with Antoine Wright, will force Triano to possibly rethink his decision to start hopeful rookie DeMar DeRozan at the point. DeRozan, who has better athleticism than both his backups, receives less minutes while in the starting role and has trouble containing opposing guards. Meanwhile, the rest of Toronto’s starters carried most of the offensive load. Chris Bosh had his 7th double-double of the season scoring 21 points to go along with 14 rebounds, while Andrea Bargnani and Jose Calderon scored 19 and 18 points respectively. For Calderon, it was the second consecutive game he has scored 18 points, and it looks he may finally be in top form. “I think with the repetitions of him playing more, he’s become a lot more comfortable,” Triano said of his starting point guard. “He seems to be a lot more confident. The raptors will head to Phoenix to play Steve Nash on the Suns on Sunday night. Occasionally a play hits Broadway that gets the critics and audiences into an uproar of uniform praise and downright worship. I’ve never seen one of those plays before. Truth be told, I have only seen a handful in my day. The last was a brilliant one man act called ‘Barrymore‘ starring Christopher Plummer in 1998. Jesus, it’s been 11 years since I have tried to broaden my culture and take in a live performance; and after seeing August: Osage County I dare say I will be heading to the theater more regularly. The play gets points right off the bat for NOT being a musical. One of the factors preventing me from going to the theater was my incorrigible hatred of musicals. Osage County is no musical. It had been described to me by an old woman outside the Princess of Wales Theater as a ‘splendid story of family, alcoholism, drugs and betrayal’. I bought two tickets immediately. The story is set in Pawhuska, Oklahoma, 60 miles northwest of Tulsa. The dark, comedic theme was established from the opening scene as Beverly Weston (Jon De Vries) interviews eventual housekeeper, Johnna (Delanna Studi), a Cheyenne Indian. Beverly Weston is the patriarch of the Weston family – an alcoholic poet who had once been praised for his prose but who now lives a life in an inebriated darkness with his prescription drug addict wife, Violet (Estelle Parsons). Act 1 introduces most of the Weston family. The eldest daughter, Barbara (Shannon Cochran) has been recently separated from her husband, Bill (Jeff Still) and navigating through her own inner demons while trying to win the affection of her 14 year old daughter, Jean (Emily Kinney). Ivy Weston (Angelica Torn) is the middle child who took the role of pseudo caregiver for her parents who were too busy self medicating to be trusted to take care of their own affairs. The story begins to take shape when Beverly goes missing for 5 days and is eventually found dead in an apparent suicide. His death brings the rest of the Weston clan back to the estate where individual frailness and a catacomb of closeted skeletons seems to haunt each individual family member. There are so many tributaries, sub plots and circumstances that listing them would turn this review into a novella (the play itself was over 3 hours long); but the authenticity displayed by the actors, especially Parsons and Fordham, afforded no worries about the time elapsed. A keen, witty and often unpredictable dialog created one of the funniest and heart wrenching stories I have ever seen or read, typified by the relentless audience laughter heard throughout the performance. The rapid fire punch lines are balanced with tragic and sometimes evil revelations, such as the youngest Weston daughter’s fiancée and his advances on their 14 year old niece, or the apparent substance abuse problem Barbara inherited from both her parents. After moderate success in his debut film ‘8 Mile’, Eminem is taking another crack at the big screen in his upcoming film entitled ‘Shady Talez’. The 37 year old will play three different characters in the comic book style horror flick, hoping to deflect the assumption that he only had the range to basically play himself in a feature length film. Eminem apparently also co-wrote the flick with Underworld star Kevin Grevioux. The rapper, whose popularity has diminished over the years after 2 sub par albums, will try to jump start his career after a series of embarrassing moments in the spotlight, including being dissed by diva Mariah Carey and being teabagged in public by Sacha Baron Cohen. Eminem admitted he was in on the publicity stunt, a startling admission considering the bulk of his fans are homophobic and were already becoming disenchanted with Em’s deteriorating music career. Over the years Marshall Mathers’ flow has become a shadow of what it once was, his verbal gymnastics morphing into a predictable, monotonous style, turning the one time hip hop hellion into just another emcee. It has been rumored that his ability to rhyme was directly related to his consumption of ecstasy, but since experiencing a near methadone overdose while on tour in 2005, Eminem has apparently been clean. In what some are calling an obvious imitation or at the very least an unbelievable coincidence, a leaked photo of Eminem in his Shady Talez make-up has a striking resemblance to Heath Ledger as The Joker in the Dark Knight. Art may be imitating the life of a deceased artist, and the risk Mathers is taking by potentially attempting to remind viewers of Ledger’s brilliant performance could be the nail in his acting coffin. No word yet on who will be directing or co-starring in the film. Shady Talez is scheduled to be released in the fall of 2010. The Toronto Raptors have seen this script before. After shooting the lights out in San Antonio last night, Toronto collapsed under the weight of their inferior perimeter defense and rebounding woes to lose to the Spurs 131-124. With Tony Parker and Tim Duncan out with mild injuries, Manu Ginobili picked up the slack scoring 36 points off the bench while Antonio McDyess grabbed 5 offensive rebounds – equaling the team total for the Raptors who pulled down just 29 boards. While Toronto’s offense was stellar – including a 32 point night by forward Chris Bosh – their defense was stand still, allowing Ginobli, Richard Jefferson and even former Raptor Matt Bonner to drive the lane at will. The Raptors are third last in the league in opponent scoring, giving up an average of 108 points per game so far this season. Toronto faces the Bulls on Wednesday for a 7:00 tip off at the ACC.